The stunning Belleek Castle in Co.Mayo, an absolute medieval dream, was built in the early 19th century along the River Moy, atop the site of a former abbey. Designed by the prolific architect John Benjamin Keane, the neo-gothic architecture had become very fashionable at the time. In 1961, the property was purchased, restored and repurposed as a hotel by Marshall Doran, a merchant navy officer and avid historical collector. Today, this fabulously adorned dream castle is still in the hands of the Doran family, being managed by Marshall’s son Paul. From the moment you walk into Belleek Castle, you know you are in for a special stay. Walking through the great hall, with its big open fireplace, is like stepping back through the pages of history or perhaps into an episode of Game of Thrones. In fact, the attention to detail and the beautiful tapestries, chandeliers and other antiques that span the entire hotel, create a wonderfully charming, adventurous, romantic feeling. The rooms at Belleek Castle are all individually furnished in fantastic period fashion with atmospheric trappings, beautiful light fixtures and, in some rooms, four-poster beds. 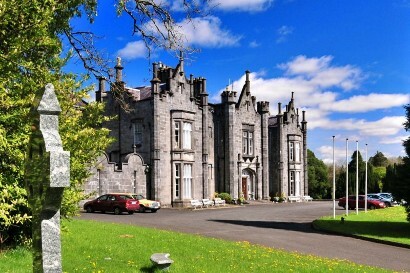 Though Belleek Castle brings you on a journey to the past, the amenities are anything but medieval, with each of their rooms ifully equipped with modern en-suite bathrooms and large flat screen TVs. When it comes to food and drink at Belleek, they have you more than covered with their fabulous Library Restaurant, where chef Stephen Lenahan leads the culinary charge with classic and imaginative dishes prepared from local, seasonal ingredients to bring patrons an experience of elegance and style befitting such a special setting. One of my favorite things to look at in Belleek Castle is the masterfully carved woodwork in the bar and restaurant. It’s just so unique, vibrant and memorable. Besides eating, sleeping and fantasizing, there’s lots to do at Belleek with daily tours inviting you to learn more about the castles vibrant history. For a little extra pampering, they have a great assortment of beauty treatments, such as massage, facials, aromatherapy, nail treatments and make-up, which are booked and carried out in the luxury of your own bedroom. Nearby, golfers are spoilt for choice with 4 links and 8 parkland courses all between 10 minutes and 1 hour’s drive. The Belleek woods, which are made up of 200 acres of woodland with trees as old as 300 years, are great too for walking, running and cycling. With Belleek Castle in a prime location to wander the Wild Atlantic Way, it really is a perfect place to go to escape reality and, just for a moment, feel like royalty.